When you travel to the beach, you look away from the routine and the speed of modern life, seek to relax. Hotel Ancora is a hotel designed conceptually to make the visitors relax and enjoy a stay in peace and harmony. Cave Temple of Ceremony offers a unique opportunity where you can combine adventure tourism and Amazonian ancestral culture. We are a certified tourism operator dedicated to tourism and to show each corner of puerto lopez. Our specialty is the charcoal meats and our fusion sea and land. We are located in the Ecuadorian Capital to offer tours tailored to all our clients. 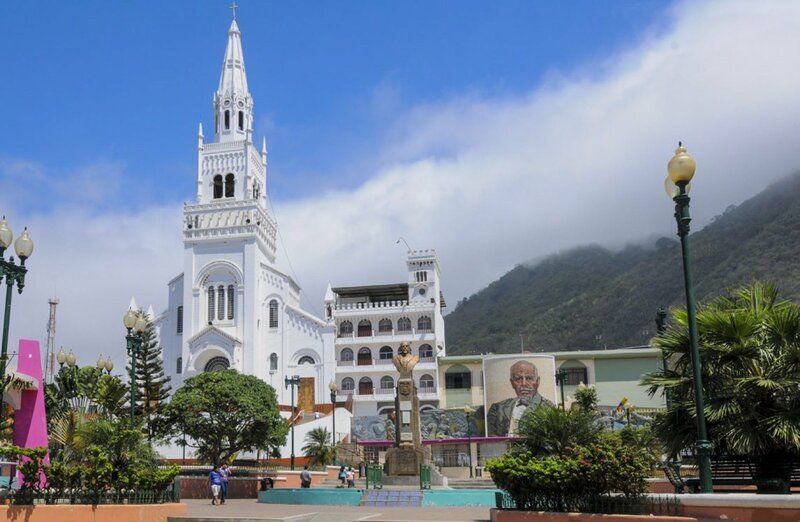 It is a canton of the Province of Manabí in Ecuador. Its cantonal head is the city of Montecristi. It is also known for the manufacture of straw hats toquilla, tagua, wicker and others. Among its greatest attractions are the Isla de la Plata. It is a canton with history and a lot of tradition. His greatest historical figure is General Eloy Alfaro Delgado, one of the greatest revolutionaries in the country. Part of their remains rest in the museum of the City Alfaro, located on the top of Montecristi hill, climbed by people who like irrigation and adventure. It has beaches, the most visited is San José. The city of Montecristi looks like a small village. Its huge and misty hill resembles an old guardian of the Manabite traditions. The people are friendly and hospitable, you can visit the Casa de Alfaro, where the museum and handicraft sales stalls are located, you can also admire the beauty of the Minor Basilica of the Virgin of Monserrat, constituted in the main attraction for the tourists, to where thousands of parishioners arrive every year. Their handicrafts made in straw toquilla, wicker, piquigua, plastic and wood are recognized throughout the country and outside of it. His identity is in the fine straw hats, recognized in the world as "Panama Hat". On the Montecristi Hill in the place called Centinela is Alfaro City. Here the Mausoleum Museum is erected in honor of General Alfaro. Inside, the ashes of this illustrious Ecuadorian are jealously guarded, inside an urn surrounded by murals and representations that narrate the main moments of the Liberal Revolution and its great work that modernized the republic at the beginning of the 20th century. It was created in 1967 by the Sisters Largachas Cevallos who began acquiring pieces that the peasants managed to extract from places such as Cerro de Hojas, La Sequita, Las Pampas, El Arroyo and Los Bajos; they are pieces in stones, bones, obsidian, shells and mud that happens to be historical testimony of excavations carried out without the techniques recommended by archeology. In this museum you can see bells, funeral urns, pots to store chicha or water, which were found in the Las Lagunas site. There are artistic stamps of circular figures, triangular as ideograms as well as whistles, axes, pots for coca, pieces of bones, mirrors with volcanic glass and different archaeological pieces of great historical value. And of culture settled in our territory Manabita. The Cardulovica Palmata, the raw material for the production of toquilla straw hats, is cultivated in the mountainous parts of the coast. The first step is obtaining fiber, locally called "buds", the bud is the bud of a new leaf of the plant, while more tender, the fiber is of better quality. Toquilla straw is a tuber or potato similar to banana. It is sown in rows, four yards (84 cm. C / rod) wide and long distance (3.36mts). Toquilla straw plantations are carefully cared for as they constitute the sources of an important agro-artisanal activity of the peasants. The color and variety depend on the terrain where they grow. The waterlogged terrains, very loaded with vegetal substances, to temperatures superiors to the 26 degrees centigrade, generally produce a straw of bad quality, because the precocity with which in them it develops, causes that the fiber is after treated and processed little resistant and brittle, in addition the color with the humidity that receives when manufactured tends to stain and becomes yellowish. The growers prefer to plant the potatoes of the toquilla straw in quite inclined places, located in the western skirts of the hills, so that the rays of sun do not hurt the plant during the morning, when they fall almost perpendicularly. The sowing of strains or suckers is done in holes of 20 to 30 centimeters, now adding organic fertilizer. Subsequent cuts must always be made in the same period, that is, if it is cut every fifteen or twenty days, this period will always be the same. As for the cut and the benefit it presents, we must take into account some requirements: when the bud is cut very tender the straw is loose and the hat has little acceptance by the white and if on the contrary, has acquired a degree of Maturity higher than necessary, never get another green color, which makes it completely useless. When the stem on which the bud rests is approximately less than one-half a yard long (1 meter long at least), leaving an inch (2.54cm) of stem attached and care must be taken not to perform this operation on rainy weather, because of doing so, the color and quality of the straw will deteriorate noticeably. The number of buds that the plant obtains depends on the number of stepchildren it has. Stepchildren depend on the age of planting and the quality of the straw. The tuber of the toquilla is sown only once and the seed is obtained in the same hills, that is, in the old toquillares. When the plant has grown enough, this is about two and a half years, you can start cutting the buds block by block (100mts), making a selection. The months of greatest production are from March to June and those of scarcity are from September to December. One of the advantages of the cultivation of straw is that it is a plant that can be grown at any time of the year as long as the climatic conditions of the places where it is planted are appropriate. Freshly harvested straw bundles have a light green color at their ends, in the center they are ivory white or pearl white. Once the buds are acquired, they are left in shade for two or three days so that the sap is eliminated by the stem. So that the quality of the hat is excellent it must be of a single pajal.